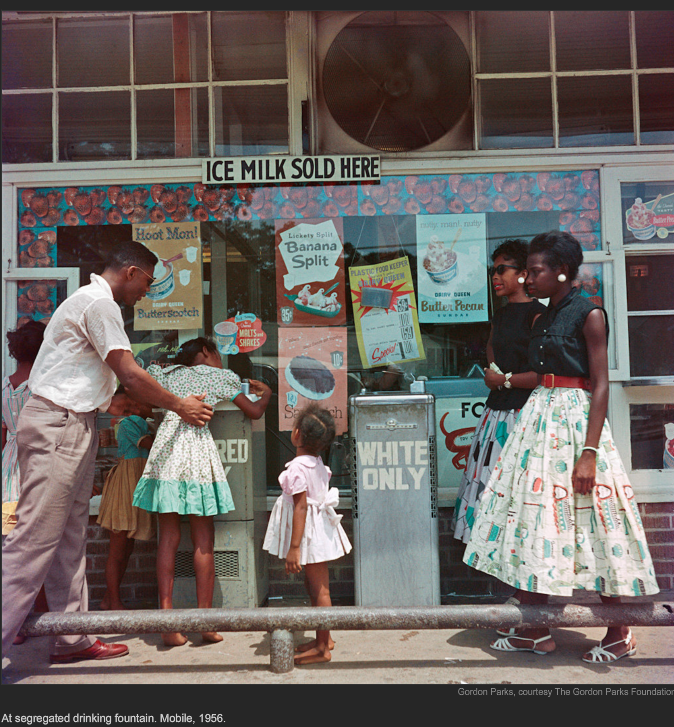 Gordon Parks worked on assignment for Life magazine while making these images, I found out about this series of images from a blog that I like: (Notes On) Politics, Theory & Photography. I Love the image below it reminds me of Robert Franks image from the Americans the one of the African American nurse holding the white baby yet this one in colour is more striking and also more interesting as it includes a white woman who we assume is the mother and it has been made with what appears to be someone in the way to conceal the camera which adds to its illicit nature and thereby increases the sense of tension within the image. The (Notes On) blog refers to a FSA item on Gordon Parks where he talks about the difficulties of representation and how does a photographer get the image to say something about a subject that is not inherently easy to photograph. As an example if I want to do a story on rich people and their expiration of wealth just photographing the wealthy will not give any new information or cause any change as they look just like all the rest of us. It is something that i am working with. 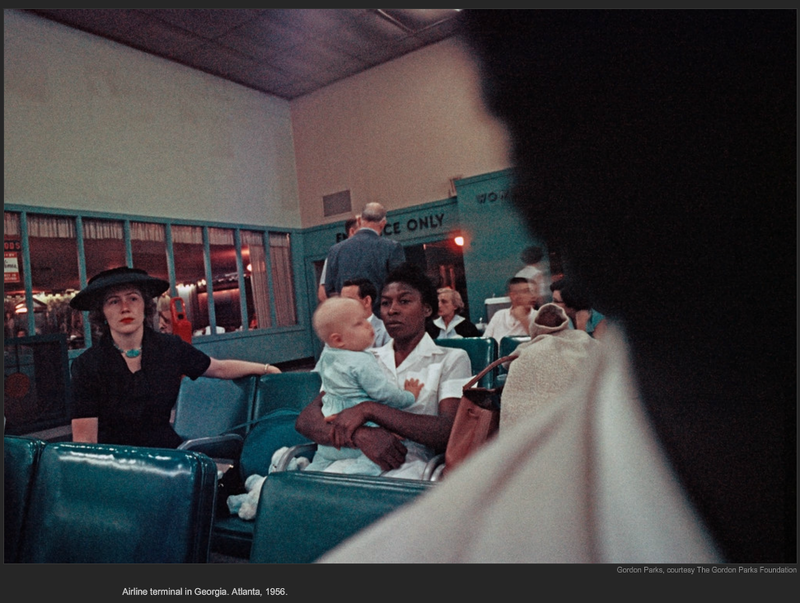 Do we just photograph the results of their actions or do we as Gordon Parks has done with this set on images have to go deeper and make a more nuanced portrayal of the subject that one is exploring. Robert Frank Image from “The Americans”. 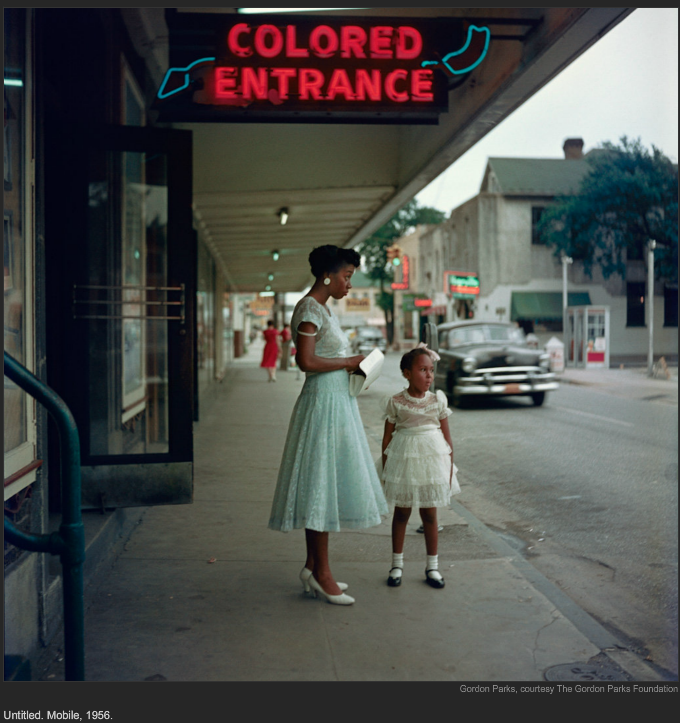 A little technical note, looking at the images by Gordon Parks, I am convinced that the images where made on Kodachrome transparency film. As they have that feel to them, which means he was working with low shutter speeds and shallow depths of field when he was making images in low light, as the iso would not have been very high at this time. We are rather spoiled these days with our high iso digital cameras. Just a few more images to encourage you to go look at the NYTimes Lens Blog for the rest of these images.